Our client Omnicell- the world’s leading manufacturer of automates supplies and medicine management solutions has announced new contracts with five UK hospital trusts. 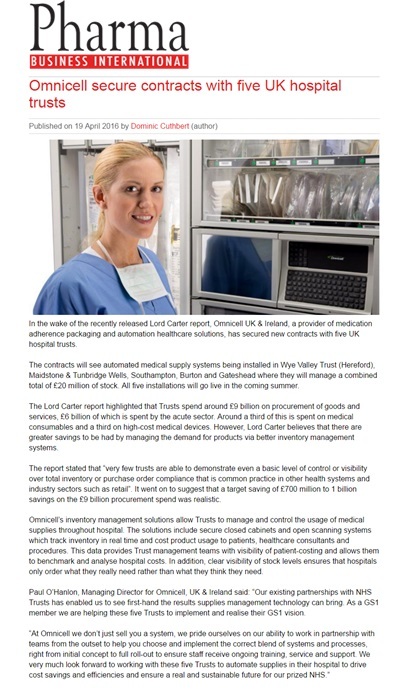 The five new business contracts will see automated medical supply systems being installed in Wye Valley Trust, Maidstone & Tunbridge Wells, Southampton, Burton and Gateshead, where they will manage a combined total of £20m of stock, with installations going live in the coming summer. Omnicell’s inventory management solutions allow Trusts to manage and control the usage of medical supplies throughout hospitals. The solutions include secure closed cabinets and open scanning systems which track inventory in real time and cost product usage to patients, healthcare, consultants and procedures. The data allows Trust Management teams to visibly see patient costing which results in the ability to benchmark and analyse hospital costs. In addition, clear visibility of stock levels ensures that hospitals only order what they genuinely need, instead of an estimate of what they think they need. Furthermore, through the use of Omnicell systems we have seen hospitals save hundreds of thousands of pounds in stock holding levels and consumption of medical supplies by automating their inventory management as well as save clinicians valuable time which can be redirected back in to face and face patient care. Paul O’Hanlon, Managing Director of Omnicell, UK & Ireland comments; ‘ Our existing partnerships with NHS Trusts has enabled us to see first-hand the results supplies management technology can bring. As a GS1 member we are helping these five Trusts to implement and realise their GS1 vision. Trinity PR successfully sold-in this case study story to a number of trade publications including Building Better Healthcare, The Pharmacist, Pharma Business International and Medical Plastics News.